It's been a while since we've talked about Mordheim: City of the Damned, the turn-based tactical combat game set in Games Workshop's Warhammer Fantasy universe. Which means this is an ideal time to have a look at the newly-released "overview trailer," which succinctly breaks down everything that Mordheim has to offer. 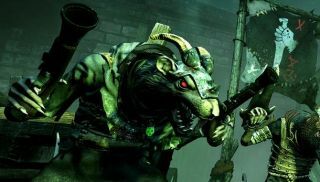 In Mordheim, you'll take control of one of four warbands—the Human Mercenaries, the Skaven Clan Eshin, the Sisters of Sigmar, or the Cult of the Possessed—select classes and assets, and then lead them into turn-based battles through the streets of a city shattered by a falling comet. It offers single-player campaigns, with unique stories for each of the four warbands, and online battles against other humans on procedurally-generated maps. Turn-based combat games don't always translate to video particularly well, but as much as it's possible to judge such things, I think Mordheim looks good. The response on Steam—it's been in Early Access release since late 2014—is pretty positive too. Have you tried it—and if so, what do you think? Mordheim: City of the Damned is slated to come out "during the first weeks of November."